Bridal portraits are some of our favorite! We love interacting with the bride and her wedding dress for photos! Jenna was an absolutely breath taking bride. She had a stunning dress. Their ceremony was at Our Lady of Victory Basilica in Lackawanna, NY. The bride and groom wanted to stay at the church for photos for as long as possible. It really is a jaw dropping church. There is so much detail in every area of the church, both inside and out. Before heading outside for pictures with the wedding party, we asked the bride to hang back for a minute. We wanted to do some photos in the back of the church. We spread out the train of Jenna's dress and with the help of her sisters, to spread out her veil as well. We also had Jenna hold onto the front part of the veil. 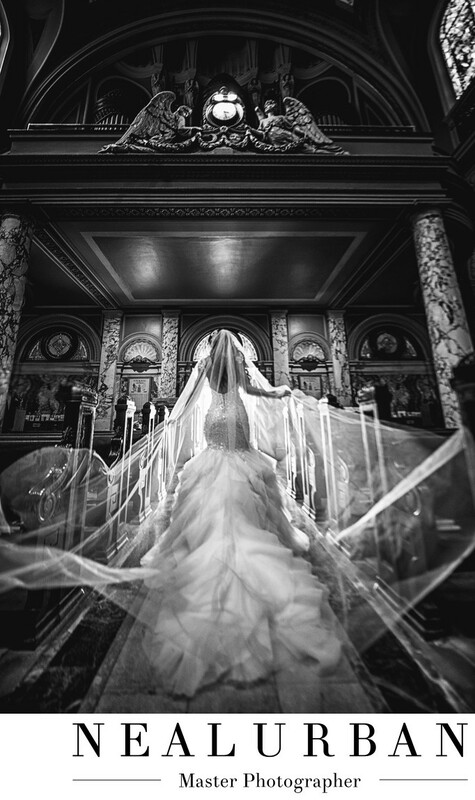 We wanted to create some form and pattern to her veil. The back light was going to make it glow! We did set up a light to get that effect. Once everyone was in place, we had the bride look to her right. When the flash went off, it also lit up the walls and columns of the church. Look at how much detail is in this image. We continued with photos with the wedding party outside of the church as well. All of them turned out just as amazing as this one. We then went to Niagara Square and City Hall in Buffalo for more photos. The reception was at the Statler which was right across the street. They had a super high end wedding! The ballroom looked amazing! Jenna and Artie's vision for their wedding was beautiful!